Identity of the New Male Falcon Revealed! 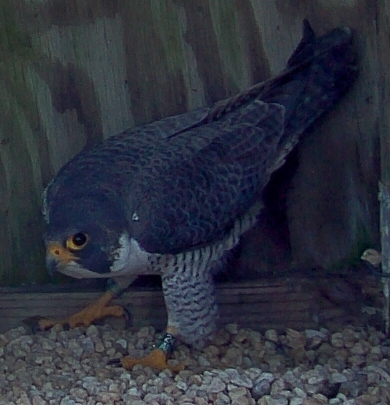 Male peregrine falcon wearing a black over green band on his left leg, reading 24/AU. On Tuesday, March 5, Richmond’s new pair of peregrine falcons paid another visit to the nest box at the Riverfront Plaza building. We caught some close up photos, allowing us to read the male’s bands. The black and green band on his left leg reads 24/AU (see inset). 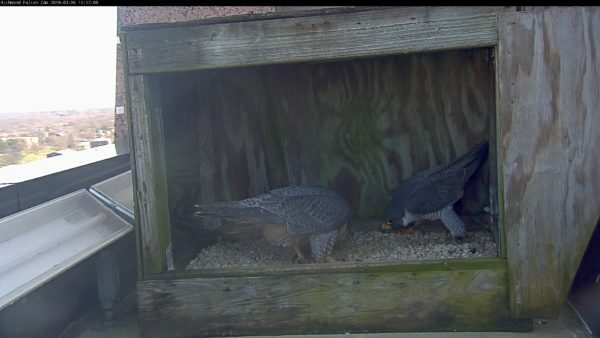 Banding records show that this male peregrine falcon hatched just north of Quantico, on the Potomac River, at the Dominion Possum Point Power Station where a pair of falcons nest in a nest box on a smokestack. The Center for Conservation Biology banded this male as a chick at that Power Station on May 4, 2015. He is three years old. This is the first resighting of this male since he fledged his nest in 2015. We are glad that he found his way to Richmond! Since the new female is unbanded, her identity and age remain unknown. 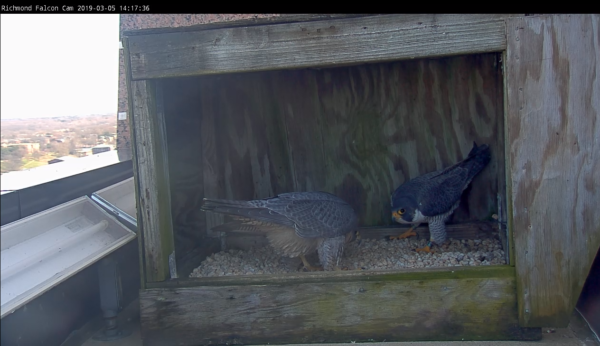 The series of photos capturing the pair’s visit to the nest box on March 5 are below. All five photos show the female (left) and male (right) engaged in a head bow courtship behavior inside the nest box at Richmond’s Riverfront Plaza building.